Don't like the results? Change the rules! Background: The Constitution does not specify how individual states must allocate their electoral votes. That is why Maine & Nebraska can deviate from the winner take all method used in the other 48 states + DC. The ME/NE approach, as well as several other alternative methods have been considered by state legislatures in recent years. While often couched as fairer, the proposals are almost always partisan in nature, meant to benefit the electoral college fortunes of the party that introduces the bill. All the methods reviewed on this page have been proposed by one or more states since 2004, although none have succeeded in becoming law. Directions: Use the interactive map below to see how alternative electoral vote allocation methods would have affected the results had they been in place for the 2012 or 2016 presidential election. Select a View to see the impact of one method (or the optimal method*) in each state. Select any individual state to rotate its method. Hover over a state to see the results for that state with all methods. The map below displays the proportional allocation of electoral votes in each state, based on the methods you've chosen in the top map. Hover over any state to see the numerical impact of any changes. Portion of electoral votes based on selected allocation method. Winner Take All (WTA) awards all electoral votes to the popular vote winner of the state. This is the current methodology in all but Maine and Nebraska. Congressional District - Popular (CDP) awards two electoral votes to the popular vote winner of the state, with one each allocated to the popular vote winner in each individual Congressional District (CD). This approach is used by Maine and Nebraska. Congressional District - Majority (CDM) awards two electoral votes to the party winning the popular vote in a majority of the CD, with one each allocated to the popular vote winner in each individual CD. Proportional Popular - Popular (PPV) awards two electoral votes to the popular vote winner, with the remainder allocated based on the percentage of popular vote earned. Popular Vote by State (PVS) is the same as PPV, except all a state’s electoral votes are allocated by popular vote. One reason these alternatives have not had more legislative success is a recognition that things can change. For example, in 2013, Pennsylvania Republican State Senator Dominic Pileggi introduced a bill that would change the state’s allocation to roughly reflect the popular vote. This proposal was clearly meant to benefit his party, which had just lost its 6th consecutive presidential election. Mitt Romney would have won 8 of the state’s 20 electoral votes under Pileggi’s plan. Fast forward to 2016, the first election the new rules would have been in place. Donald Trump broke the Democratic winning streak. This legislation would have cost him 9 electoral votes. It is important to note that the actual results of a real-world election might be significantly different than how the numbers look applying new methodologies after-the-fact. Campaigns make strategic and tactical decisions based on the rules in place. For example, the Obama campaign expended resources in an ultimately successful bid to win one of Nebraska's electoral votes in 2008. They would not have made the effort except for the allocation method used there. Additionally, voter turnout could shift in response to where battlegrounds might be with new rules. Winner Take All: Trump won an electoral vote in Maine, which he would not have won if Maine used winner take all. Congressional District (CD): In 2012, Romney would have gained 68 electoral votes from the 206 he won, putting him in the White House with 274. This year, Trump would have lost 16, giving him 290. Trump won a number of states that Romney lost, such as Pennsylvania and Ohio, with a large portion of conservative districts. As a result, in these states, the congressional district method would be less beneficial to Trump than winner take all. There aren't that many battleground congressional districts in 2010's-era America. This makes the congressional district method much more stable than winner take all. Trump won 230 congressional districts, little changed from the 226 won by Romney in 2012. He also won 6 states that Romney lost. So, while those six states gave Trump 99 more electoral votes than Romney (excl. Maine district), he only improved on Romney's 274 by 16 (6 states @2 each, 4 districts @1 each) with this allocation methodology applied nationwide. During January, 2017, Republicans in Minnesota, New Hampshire and Virginia introduced legislation to adopt the congressional district method. These are all states that were won by Clinton in 2016 and have not voted Republican since 2004 or earlier." In 2016, Trump would have won 12 of 27 electoral votes in these three states had this method been in place. CD Majority: This method will only yield different results than the other CD method when the state popular vote winner doesn't also win the majority of districts. That was infrequent in the 2016 election. Clinton won two states (Minnesota, Virginia), where Trump won a majority of the districts. She also won three states, where the two split the districts. (We split the electoral vote in these cases). As a result, Trump did seven better (297 to 290) with this variation of the congressional district method. 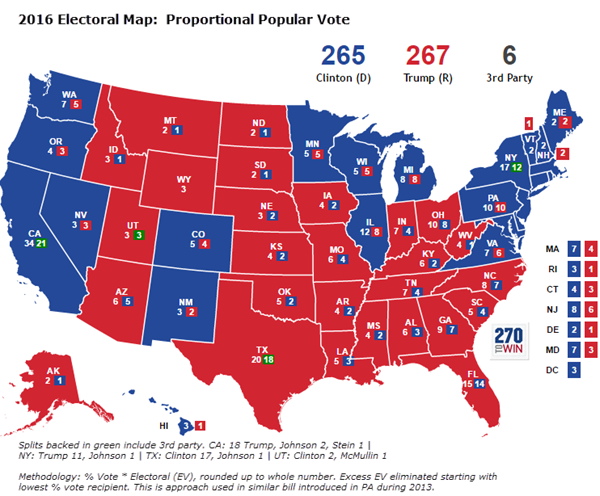 Popular Vote Methods: Since Clinton won the popular vote nationally, we would expect these results to be close, and indeed they are. Trump still wins with Proportional Popular - Popular because he won many more states (30) than Clinton (20+DC). That fact still benefits him - although less so - in Proportional Popular because the allocation is done state-by-state. 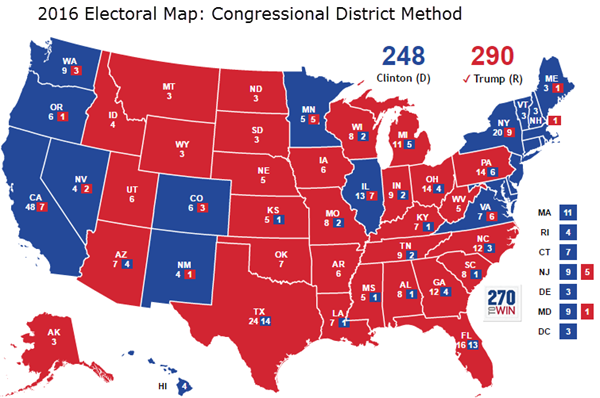 Due to the relative success of third party candidates in 2016, neither Trump nor Clinton would have achieved 270 electoral votes (see map below) with this second popular vote allocation, throwing the election to the House of Representatives. * Where there is a tie, we prioritize based on the order the methods are listed in the Select a View dropdown. This is a completely arbitrary ordering. Data on winners by Congressional District courtesy of Daily Kos. Our use does not imply an endorsement of that site's political point of view. The 3 electoral votes for Washington DC are awarded to the Democrats in all 5 methodologies.